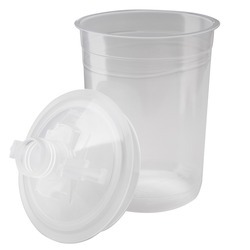 Kit contains 50 disposable lids with 200 micron filters, 50 disposable liners, and 20 sealing plugs. The 200 micron filters are recommended for traditional solvent based paint or primer applications. Graduated measurement to 5 1/2 oz when used with generic mix ratio film insert (mix ratio inserts sold separately). Max. capacity of 6 fl oz. For use with part number 16115.